The National Weather Service (NWS), Guam Weather Forecast Office is closely monitoring a developing circulation east-northeast of Majuro. 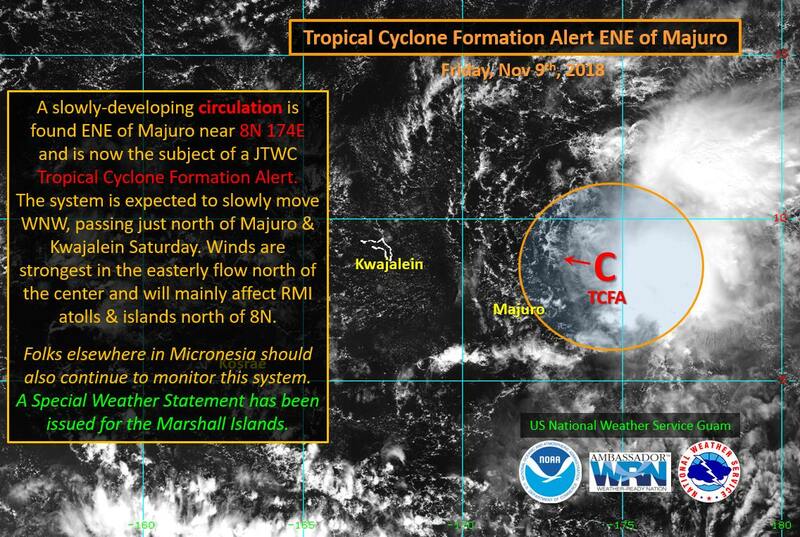 As of this afternoon, the circulation is about 230 miles east-northeast of Majuro and is now the subject of a tropical cyclone formation alert by the Joint Typhoon Warning Center. Current models indicate a slow west-northwest track over the next several days with the system passing just north of Majuro Saturday. As advised by NWS, it is still early to tell what impact, if any, the developing system will have on the Marianas. It is still far, possibly a week out. More information will be provided through the coming week. While there is no immediate threat to Guam or the Marianas at this time, the Offices of Guam Homeland Security and Civil Defense (GHS/OCD) will continue to monitor the system closely with guidance from NWS and provide updates as needed.